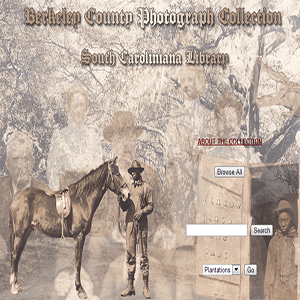 Once part of an album, the photographs (circa 1900) show plantations, African Americans, horses, hunting, rice threshing, wagons and carts, and churches in Berkeley County, S.C. Some featured landmarks are: Medway, Wappahoola, Mulberry Castle, Dean Hall (bulk of collection,) Dockon, Bushy Park, Exeter, Cote Bas, Bippy, Lewisfield, Strawberry Chapel, Strawberry ferry, and pine land house. People who are identified in the photographs include Col. Jim Petigru Carson, S.P. Stoney, and the Stoney family.